The World’s Smallest Movie – Made with atoms! Let’s not go nuts about the artistic merit of this stop-motion animation. There is a definite trapping with art that utilises technology, that it is really the technology that we are amazed by and you barely even notice the content…but in this case, WHO CARES!…This is amazing! So, the question remains, how on earth did they make this? Well IBM and CFEL (Center for Free-Electron Laser Science) have been working on making the smallest possible magnet to be used for data storage, which believe it or not, is made up of only 12 atoms! They build this unit one atom at a time, moving each atom individually. Throw in a camera and you have the traditional method of stop-motion animation. The story line of Adam finding an atom, playing and generally larking about with it, is in a way mirroring what the researches are doing at IBM: “The ability to do something just because you find it interesting is a really important thing, particularly for research, because that’s how you stumble across things that are new,” said Ileana Rau, Post Doctural Research, IBM Research. The 12 atom magnetic data storage unit is set to revolutionise the form of computing. With devices getting smaller and smaller all the time, how we carry/wear our devices is likely to change dramatically. Smart watches and Google Glass (a computer, camera and screen formed into a pair of glasses) is just the beginning, the limit is really our imagination. How do magnets work in data storage? The smallest unit of data storage is a bit, which can either be a value of 1 or 0 in binary code. This is stored on your hard drive by a read-write head locating a single bit storage unit and magnetising it, by causing the north pole of the magnetised material to face up or down. When this information is needed, the ‘read’ part of the read-write head finds the storage unit and picks up the magnetic configuration, which is interpreted as a 1 or 0. Each storage unit must be placed a set distance away from the next one so that their magnetic fields cannot interfere with each other. The magnetic data storage unit created by researchers at IBM and CFEL is made up of two rows of six iron atoms (pictured right), meaning one byte (8 bits) is stored on 96 atoms. To put this in perspective, a modern hard drive needs more than half a million atoms per byte. 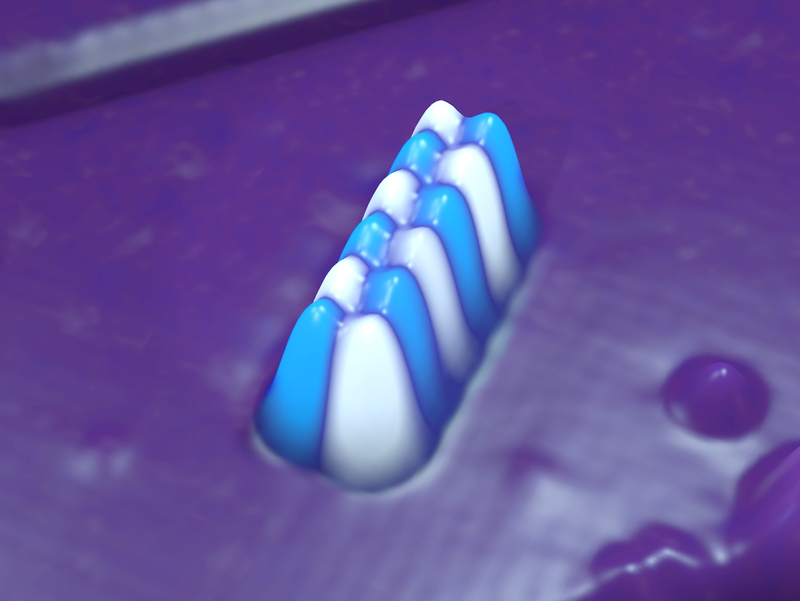 With this new technology a byte of information, stored on 8 pairs of atom rows, measures just 4×16 nanometres. A nanometre is a millionth of a millimetre, so as you can see (well not really) this is mind bogglingly small! So when will we see this new technology in our devices? Moving and storing these atoms happens at -268°C to stop them moving around, which unfortunately means they are not stable at room temperature. Researches do expect units of around 200 atoms to be ok, but it will be a fair while before atomic magnets find their way into your smart phone. Still, that’s something to look way forward to, ay? Previous Music Video – Photoshop for video??? Next Will We Ever Run Out of Music?